Only goal difference is keeping St Patrick's Athletic out of the top four, and the European places, after they made it three wins in-a-row with a 2-0 dismissal of Sligo Rovers on Tuesday night. 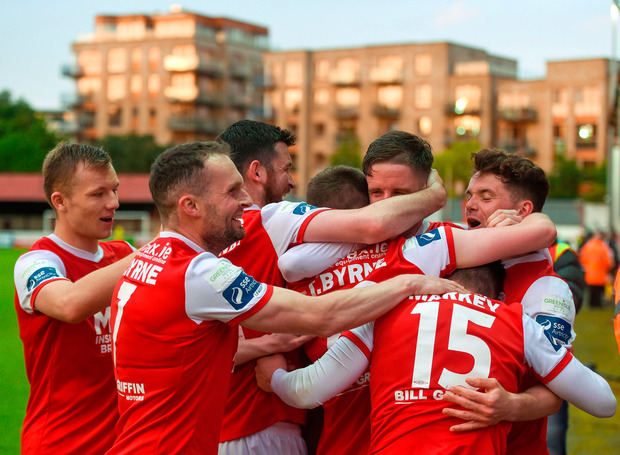 A third straight clean sheet gave Liam Buckley's side the platform to work from, and a goal from winger Dean Clarke six minutes into the second half set them on their way and a 90th minute penalty from Thomas Byrne capped off a good night for the home side. Pat's had dominated the first half, though the best chance of the first 45 minutes came to Sligo wide man Adam Wixted, whose shot was saved by Barry Murphy. But on 51 minutes, Clarke was unmarked in the box as Simon Madden's cross came his way and he fired home. Ryan Brennan, Killian Brennan and Conan Byrne all tried to add to that goal tally as scorer Clarke was forced off due to injury, Killian Brennan forcing a fine save from keeper Mitchell Beeney . Veteran Raff Cretaro added something to the Sligo attack when he came off the bench and while Rovers had their moments in the final minutes, it was not enough to trouble Murphy in the Saints goal. Ireland U19 cap Thomas Byrne stepped up in the final minute, converting a penalty after Jack Keaney fouled Jake Keegan in the box, this win setting the Inchicore club up for Friday's test at home to a Derry City side who are just ahead of them in the league table.